It's so important that our kids know the Articles of Faith. They are essentially our beliefs in a nutshell. If you get a chance, read this SHARING TIME from lds.org on the Articles of Faith. It's so awesome. It tells how they came to be and why they are important. In this particular article, President Monson tells a powerful and inspiring story about a young girl who taught our beliefs to an inquiring adult by reciting the A of F's, resulting in his and his entire family's conversion and baptism! All because a little girl knew her Articles of Faith well enough to be able to share them. Pretty awesome, right? So anyway, I have been asked by some friends if I'd share my little Articles of Faith Chant/Ditty/Song (whatever you want to call it). My family and I came up with this a few years ago during Family Home Evening to help us remember what each Article of Faith is about. It's worked like a charm (even for me). I love to quiz my kids on it. They can tell me on the spot what each is about now. We also used it for a couple years in my previous ward's primary. And let me tell ya, those kids know their A of F's! To use image: Right-click on it and "save picture as..." name it and save it somewhere you'll remember. Open a word document and insert image. Re-size to fit your page. Print. *If you'd like a better quality copy, leave a comment with your email and I'd be happy to send the pdf. I'm thinking about making a YouTube video so you can hear how it goes. Not sure if it's really needed or not. Let me know what you think. The best I can tell you without a video, is to add a small pause when you see the . . . 's. Most of these ditty's are said in 4 counts. In fact, #'s 1,2,3,4,7,8,9, and 13 are said in 4 counts and are pretty simple. Numbers 5,6, 10, 11, and 12 are said in 8 counts. On number 6 (it's kind of tricky), you say "Six, Six" in 2 counts, "is no surprise" in 2 counts, and then you have to jump the gun on "tells" (like a grace note), and say "how our church" in 1 count ("how" being on the downbeat), "was and is" in 1 count ("was" on the downbeat), and "or-ga-nized" in 2 counts (evenly spacing the 3 segments of the word in 2 counts...kind of like a triplet, only said in two counts instead of 1). If you snap your finger as you say it, it's much easier. See also- General Conference Activities. In my post, find the "Saturday night Priesthood Session Activities" segment, idea #11. It talks about how we've turned our learning the Articles of Faith into a game show. Teaching/learning the gospel can be so much fun! Teach/learn with a vengeance! 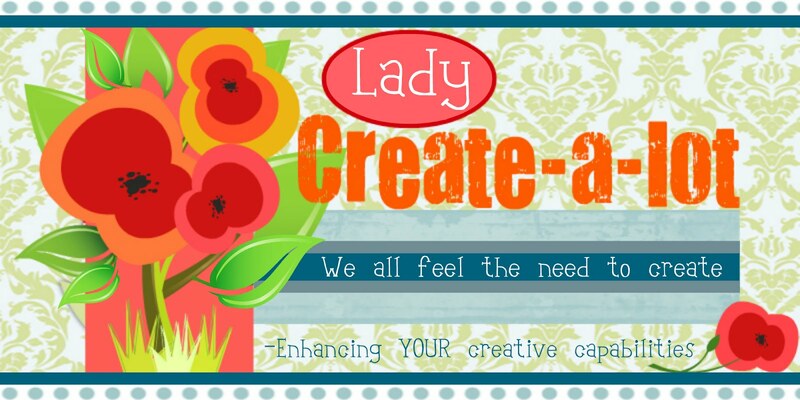 I'm linking up @ Blue Cricket Design, Lil' Luna, Mo momma, Crafty Confessions, Southern Lovely, I'm Topsy Turvy, and Gluesticks. thank you so much I've been looking for something like this to use a activity day with the girls. Very COOL!! Thanks for stopping by! I'll link to this on Sunday's Pinterest finds! Love the articles of faith helpsheet..
Can you send me a pdf... thanks. I have a mac and it did not like the download..
thanks so much for this. I think it will be a big help for my girls trying to memorize the Articles of Faith! Love this! What a great way to help the kids remember the AoF. Would you send me the PDF file? I would love to use this in my Primary. This is awesome! Looking forward to helping my kids learn the articles of faith with this. Could you please send me the Pdf for this. Thank you so much! Carol said...Thank you so much for sharing. It is a great idea. Would you please me a pdf. Hey Amy, I just received an email from Trudy about your blog. It looks interesting so I will share it with my kids. I would love to have a pdf...my email is sharla_borrowman@yahoo.com. Also, I think it would be tremendously helpful if you did a you tube video to demonstrate how the ditty goes. I know it would help me and I am sure at least some others would appreciate it too! Please, do post one! I am excited to try it with my kids! I would love a a pdf copy. I would love to have a copy of this, too. 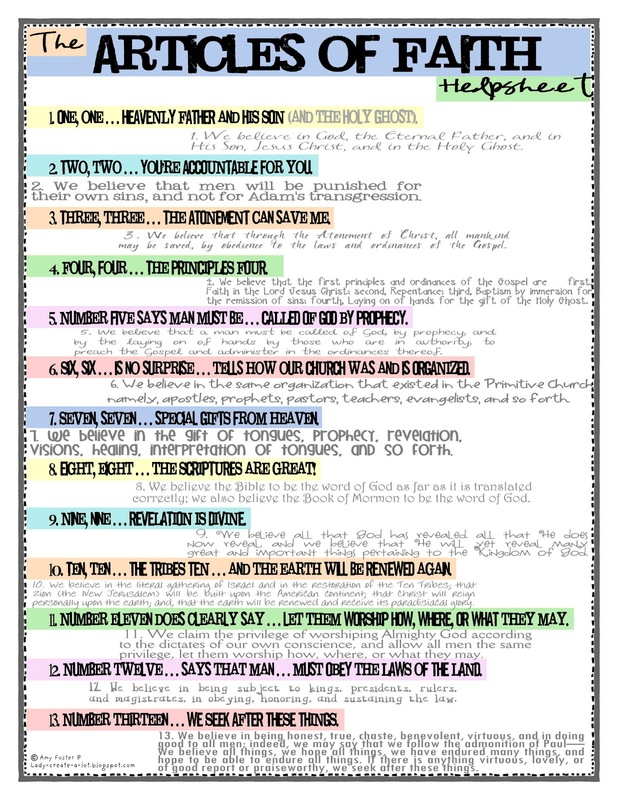 I know these kids learn them in primary, but I find in my Sunday school class (12-14 year olds) that they don't have them completely memorized.Thanks so much for doing this! I would love to have the PDF...my iPad doesn't like it the first way. This is great, thanks for sharing! Can I please have the pdf ? I love this idea! My son trying to get his Faith in God soon so this will really help! Could you send me the pdf? bbkrn@yahoo.com Thanks! I would love a copy of the pdf. Thanks for all your hard work! This is awesome! Oh please, please, please put this on you tube. I have been looking for something like this, but I really need to hear it. PLEASE send me a copy of this I LOVE IT! Hopefully you are still sending out pdfs. I would love to get one! This is way cute, thank you so much! Can I please have you send me the pdf? Love this! Have you "You Tubed" this? Would love to see that as well! The Activity Day Girls in our ward will love this! I would appreciate it if you could send me a pdf copy of the Articles of Faith Helpsheet. Thanks! I'm in A-Days as well and would love the pdf version. Thanks! love this for activity days.. so perfect and fun! May I have the helpsheet emailed to me? This is perfect. Did you ever make a youtube video for this? could i get a pdf of this?? THANKS A MILLION! I think this is great. If you could send me a copy of the PDF that would be fabulous! Hi! Can I get a copy of the PDF also?? I am loving this for my Activity Day girls! Such a cute idea! If it's still possible, I would love to receive the PDF file. Thanks so much! Perfect! I'd love it in pdf form. I would love the pdf. Thanks. This looks great! I would love a pdf. Would you mind sending me one? Thank you so much. Is it still possible to get the pdf? Thanks! Did you ever make a youtube video with this? Are you still sending out the pdf file of this? I tried putting it in a Word document but it turned out pretty blurry. Thanks! I would love to get this in PDF form. Thank you! Would you please send me the pdf? Thank you for sharing your time and talent. This us creative and wonderful,I would love a copy. kimberlygraham@mail.com Thanks! Love this.... If it is not too much trouble could you please send a pdf. It doesn't print too clear from the site. Would you please send me a pdf of The Articles of Fatih to coleyduncanmd at mail that is hot? Thank you!